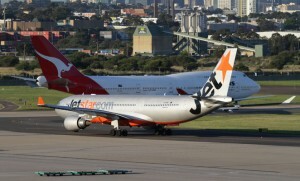 The Qantas Group has reported robust 8.8 per cent growth in traffic across its three airline brands – Qantas, Jetstar and QantasLink – in October compared to October 2009, but as RPKs increased by 5.4 per cent but ASKs an even faster 6.4 per cent, revenue seat factor fell 0.8 percentage points to 82.5 per cent for the month. The Group carried just over 4 million passengers in October, with 1.6m of those on Qantas domestic flights (up 5.2 per cent), 848,000 on Jetstar domestic (up 13.2%), 526,000 on Qantas international (up 1.0 per cent), 446,000 on QantasLink (up 17.9 per cent), 353,000 on Jetstar international (up 4.4 per cent), and 238,000 on Jetstar Asia (up 31.2 per cent). 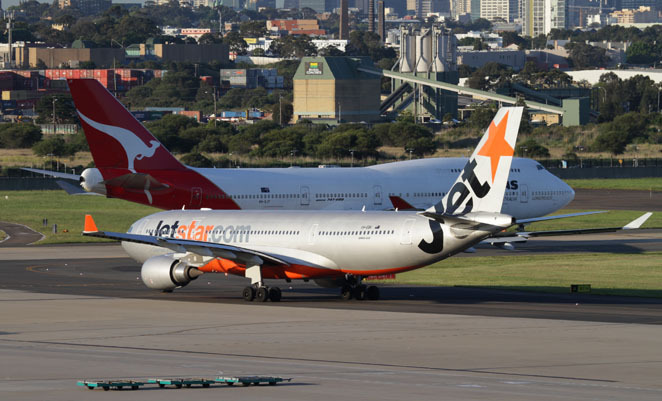 Significant capacity was added to the Jetstar domestic (up 16.9 per cent), QantasLink (up 17.9 per cent) and Jetstar Asia (up 41.5 per cent) networks in particular. Qantas domestic RPKs were up 6.8 per cent, Qantas international up 1.5 per cent, and Jetstar international up 8.6 per cent. For the financial year to date to October 2010, group passenger numbers rose 8.8 per cent on the previous year. RPKs were up 6.4 per cent, ASKs 7.4 per cent, and thus revenue seat factor fell 0.8 points to 81.8 per cent.